An incredible flying car has been developed to let drivers skip traffic jams and take to the skies. 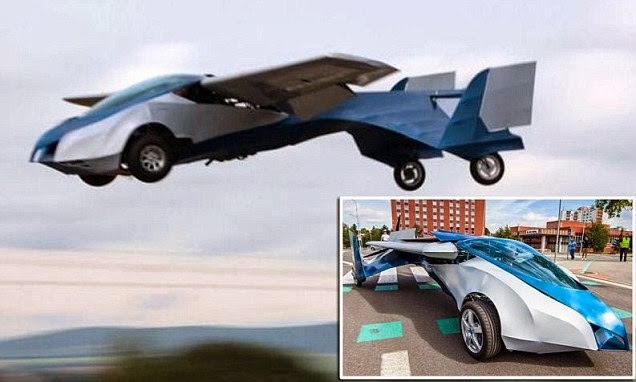 The vehicle can be driven on normal roads as well as being flown as a two-seater airplane, as it is able take off and land at any airport, 'opening the door to real door-to-door travel,' according to a Slovakian company. Named the AeroMobil 2.5, the hybrid invention was unveiled at AeroTech, an airshow exhibition held in Montreal. The vehicle has a maximum speed of 99mph when driven as a car, but in airplane mode can soar through the skies at 124mph. The prototype is part of an ongoing project by the AeroMobil Team led by co-founders Stefan Klein and Jurak Vaculik, who are based in Bratislava, in Slokavia. Tatiana Veber, AeroMobil spokesman said: 'We have been developing the concept of a flying car since 1990. 'Our first model looked quite bizarre and it would have problems in the regular use. 'That was a signal to improve the concept of the flying car in a way to become an integral part of the regular road traffic. 'We got a positive feedback from several experts in avionics, which appreciated design and the technical solution of the process of transformation. The company claims the vehicle can be parked in a standard parking space and can be driven on normal roads. When used as a car, the vehicle has a range of 310 miles and measures just over one-and-a-half metres wide. Built from light-weight steel framework and carbon coating, when converted into a plane, the vehicle measures just over eight metres wide and six metres long to accommodate two people. The increase in width is due to the unfurling of its collapsible wings. The vehicle, which weighs 450kg, has a take-off speed of 90mph and a range of 430 miles as an airplane.